Blade with at widest 2.5"
leather covered wooden, ringed sheath is included. 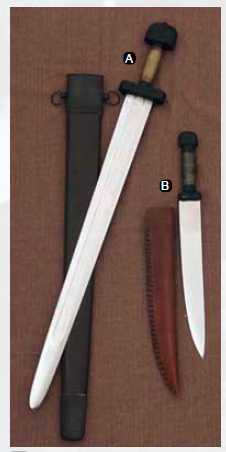 A: The sword blade is broad in width and crafted entirely in EN45 carbon spring steel. The edges are straight, with a slight angle that makes the blade a bit narrower near the tip than at the waist, while it still comes a rounded point, making this blade a more pronounced cutting and cleaving weapon. The short guard and large Viking knot pommel are both made from blackened steel, while the hilt features a leather wrapping, to ensure its comfort and solid grip. Given its full-tang construction and hardy steel make, this sword is perfect for light combat and reenactment, as well as for carrying and display. It comes complete with a wooden, leather wrapped scabbard. Over all length 36", Blade length 29.5", Blade with at widest 2.5". A handsome leather covered ringed sheath is included. Viking swords displayed at the Wikingermuseum in Haithabu. This page was last modified on 8 June 2014, at 15:46.